‘Gun Disassembly 3D’ Review — Second Amendment, Meet the App Store. Less of a game and more of a demonstration of each and every working part in 5 different handguns, Gun Disassembly is a technical app with an extraordinary amount of detail in both the included weapon models and their many animated parts. To begin, there are two handguns to choose from, the Colt 1911 and Glock 17. Selecting one of these enables you to view a complete demonstration of the gun being completely disassembled and then re-assembled. The demonstration and the game component itself is set around a 3D model of the weapon, with the camera able to zoom and pan around various components. The demo runs through the correct steps (complete with full animation of even the smallest screws being removed) and the game mode then has you replicating these steps to achieve the best time score possible. The controls are straightforward– you merely need to select the correct component on the gun, and then press an on-screen button to remove it automatically. It sounds easy, but when there are excess of 50 steps to take in the correct order, it gets quite challenging; particularly if, like us, you have very little knowledge of how these things work in the first place. The camera is controlled by the traditional swipe to pan and pinch to zoom gestures. High scores are recorded on the OpenFeint platform, and an additional 3 handguns (the Desert Eagle .44, Sig P228 and Baretta 92 FS) can be purchased for $0.99 each to further your high scores. There are also 5 OpenFeint achievements awarded for completing any of the games without using the in-game hint system. 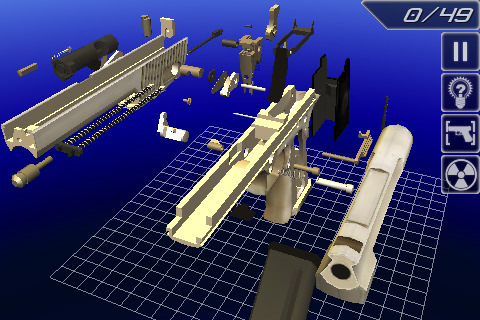 Though it is promoted as a game, Gun Disassembly 3D is nonetheless a technical app with very limited appeal. That didn’t stop it from piquing at our curiosity however, as it can be quite a singular experience to see a firearm like this being taken apart before your very eyes, let alone being able to go about it yourself. 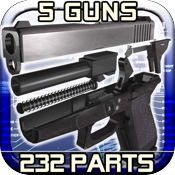 App Store Link: Gun Disassembly 3D, $0.99 (With In-App Purchases of $0.99 each).